One of the most important factors of agricultural production is land and its fertility. Fertile soil contains high levels of nutrients and a physiologically active layer, which is crucial for the development of roots and root systems. In addition, water-air, thermal regime, and pH value are essential for plant growth and development. However, conventional agriculture often has a negative impact on long-term soil fertility; it violates its structure, water-air and thermal regime, reduces the number of microorganisms that have a positive impact on the development of the plants, reduces the amount of organic matter, and various other negative consequences arise from the intensive use of mineral PGP and chemicals. To avoid this negative impact on the land, it is necessary to use organic matter and to conserve the soil microorganisms that promote the growth and development of crop plants. Wealth PGP, which is based on the lake sapropel from Baltic region, Russia; it has a beneficial impact on the land and preserves its fertility. With regard to the situation in the sector of agriculture in India, it is important to mention that it is not at a high stage of development due to the process of industrialization, excessive use of chemical fertilizers and chemical plant protection (pesticides & fungicides etc. ), a product which is having a negative impact on the soil. Organic farming in the India has an upward trend, in the last five years it has increased in production area. Taking into account the fact that Wealth PGP is the appropriate input for organic production, this product and its application will have an important role in the transition period from conventional farming to organic farming. The fact is that the world is increasingly concerned about food shortages, caused mainly by factors, such as rapid population growth, climate change impacts, and weather conditions; so the need to maximize the potential of land is growing. The last fifty years of farming was based on uncontrolled application of mineral fertilizers and chemical plant protection products which has left a large negative impact on agricultural land and the environment. Today there is an alternative that combines the efficiency of the chemical fertilizer with the environmental responsibility of organic PGP. This alternative is based on the sapropel, which refers to the highly nutritional sludge deposits of a lake (Fig. 1). Sapropel based Organic-mineral PGP "WEALTH"
The highly concentrated Complex Liquid Organic-mineral PGP “WEALTH” is based on sapropel, present in the biologically active soil conditioners obtained with environmentally-responsible and patented technology based on the interference of two natural ingredients: colloidal sapropel and active peat. The combination of these two components is such that one improves the other. Sapropel contains a rich complex of natural vitamins, minerals, and bacteria that stimulates the formation of humus in the soil, activates metabolic processes in the soil, and leads to the restoration of fertility. Peat improves the structure and aeration of soil, enriches soil’s humic acids and increases the ability to retain moisture in the soil. 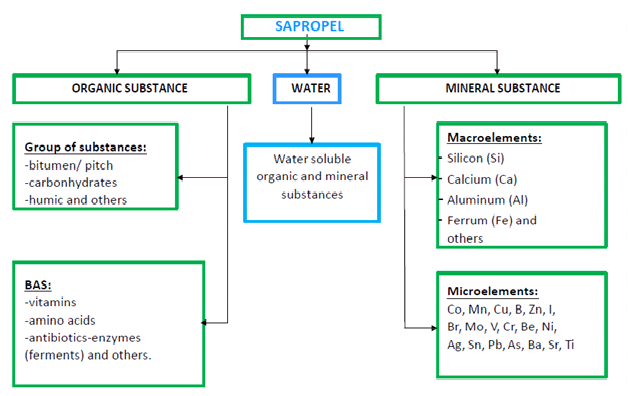 Substances that are found in sapropel are shown in Figure 2. Properties of this kind of PGP are multiple. This kind of PGP increases the content of humus in the soil and they prevent its erosion, and thus it restores the fertility of the soil and improves its structure. Application of this PGP leads to the increasing of the moisture content of the soil (4-5 times). In addition to the above mentioned facts, these PGP significantly increase yield and reduce the period of maturation of agricultural products. Organic PGP based on sapropel significantly neutralize excessive concentration of radioactive substances, excessive concentrations of heavy metals, pesticides and chemical fertilizer salts in the soil. Traditional forms of organic fertilizer (manure of poultry and catle origin) include: weed seeds, pathogens and other unwanted chemical ingredients, which are reflected in the health and safety of products. Unlike the others, PGP based on sapropel are completely decontaminated from pathogenic organisms, and in addition they increase the mobilization of nitrogen, they clean soil of pathogenic fungi and harmful microorganisms. PGP based on the sapropel contains about 1012- 1014 micro-floral colonies /g, while being fully released from the pathogenic organisms, and thus they affect the rapid growth of plants. Manure which is used as an organic fertilizer contains small quantities of microorganisms 109 colonies /g. This refers to a variety of microorganisms, including pathogens. Manure and other organic matter require the implementation of long-term preparation (6-12 months) before application to the soil. Useful substances found in manure are partially being lost, and the rest of the nutrients is available to the plants in 2-4 years after the application to the soil. During the season, about 80% of manure is flushed out of the soil and therefore it is necessary to re-apply it each year in large quantities. Unlike manure, sapropel based PGP, due to its active form of organic material, is accessible to plants immediately after application to the soil. PGP based on sapropel has the ability to provide the necessary plant nutrients gradually over an extended period of time, thereby reducing its “wash-out”. As a result, small amount of organic fertilizer based on sapropel applied to the soil, remains active from 8-14 years. Sapropel based PGP contains natural humus complex, that includes humic, fulvic, and amino acids. Humic acids from sapropel unlike peat humic acids have a higher content of nitrogen and hydrogen, nitrogen and 60% of nitrogen humic acid refers to amino acids. Humic substances of sapropel have adhesive properties so they associate minerals in the soil, which significantly improves the structure of the soil and affect the growth and development of plants. 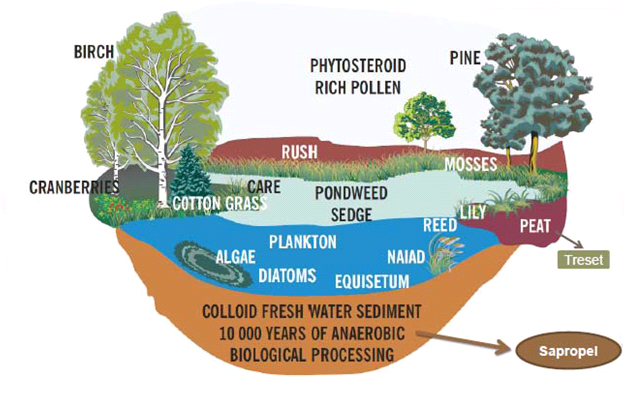 When compared to the peat, sapropel has a greater content of readily hydrolyzable materials, including hemicellulose and nitrogen compounds. Sapropelic PGP in comparison with other PGP, has a higher content of nitrogen (N), which is longer stored and better accumulated in the soil. This is very important because the lack of nitrogen reduces the resistance of the plants to various diseases. Due to the anaerobic process of the formation of sapropel, the total amount of nitrogen is completely reserved, and moreover, the content of water-soluble nitrogen – (NH 4) – is increased by 10-15%. carotene (provitamin A), B1, B2, B3, B5, B6, B12, E, C, D, P, and folic acid. Co, Mn, Cu, B, Zn, I, Br, Mo, V, Cr, Be, Ni, Ag, Sn, Pb, As, Ba, Sr, Ti. Organic PGP based on sapropel increases the humus content in the soil and microorganisms and enzymes contained in these PGP can revive the “dead” land and turn them fertile. PGP based on sapropel are ecological PGP that have a positive impact on the environment, improves the soil structure and its water-air regime, reduces water consumption, binding of heavy metals, radio-nuclides, pesticide residues. All of this enables the production of food in degraded and contaminated soils. Figure-3 presents the results of the application of organic PGP based on sapropel in several countries including in India. India is predominantly an agrarian economy. The Indian economy mainly depends upon its agricultural produce. The agricultural output contributes to about 25% of the country’s GDP. As a result, fertilizers being one of the related contributor to agriculture industry, there is tremendous scope of business in fertilizer industry that too in organic as world over people are more and more transitioning towards balanced ecological lifestyle.